Comino is a tiny island, not much larger than a big rock, in between Malta and Gozo. It's most famous for its Blue Lagoon where tourists head to swim in the turquoise crystal clear waters. The colours are reminiscent of the Caribbean; sparkling whte sand and sea of an incredible colour of blue. 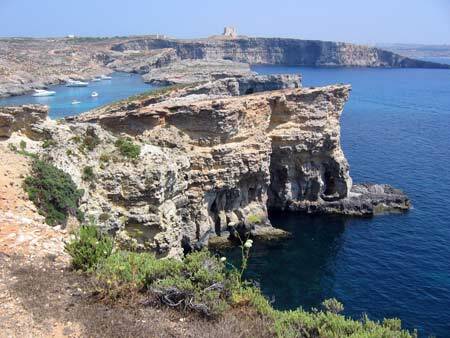 The sand based lagoon is fringed by rocky caves and stony outcrops of limestone - the foundation rock of Malta. The clear waters of the Blue Lagoon make it especially good for any type of fish watching; snorkelling or diving. The Santa Marija Caves on the north side of the island are shallow and of interest to divers because some are interconnecting or have windows into the sky. The Knights of Malta built St Mary's Tower, a signal or watch tower, on Comino as part of their defence strategy against the Ottoman Turks. There is also the tiny chapel named after 'Our Lady's Return from Egypt'. Various boat trips ferry tourists to Comino but it's also possible to get there using Malta's yellow public buses and the ferry. A tiny island called Cominotto lies 100 metres off the north west of Comino. It has a couple of reefs and a 40 m long 'L' shaped tunnel cave and high underwater arch - attractive for divers to explore.